We introduce you to the media that make Philadelphia our home. The only way to know a city is to follow its media. Use this guide to find out which publications feature round-the-clock information on popular cultural events, titillating stories, and the best places to dine outside of the tourist traps. Sure, your grandfather reads the 100-page broadsheet. But the Philadelphia Inquirer is one of the country’s finest daily newspapers, and not just because it won 17 Pulitzer Prizes in 15 years. The reporters who have worked for the Inquirer have gone on to write novels, plays and screenplays. Look out for columnist Michael Klein, who writes INQling, a local column about the daily activities around Philadelphia. His food column, Table Talk, covers the openings and closings of local restaurants, and is a must when eating out in the city. Matthew Bacine and Tayyib Smith created two.one.five magazine a little over a year ago. Now, this quarterly, can be found in coffee shops all across the city—at no cost. Check out its glossy pages human interest stories like its four-part series on immigration and its photo package on tattoos and local fashion. Hit up the two.one.five Web site for listings section and snarky reviews. Why go traditional when you can go alternative? The Philadelphia City Paper, an alternative weekly, is available at any orange box around Philly. Every week, the publication churns out the city’s best listings section, ranging from arts and entertainment to hot restaurants and DJ spots. Its true gem lies the cover stories. Featuring topics like the Philadelphia prison system, farmers markets and local comic artists, writers asks important questions about news in Philadelphia. The paper has won three awards during by the Association of Alternative Newsweeklies. Every year, Philadelphia Magazine dishes on what it loves most around Philadelphia. Its “Best Of” issue has become a staple item for Philadelphians, and it’s so popular that magazines across the country have copied its format. (One magazine even went as far as placing the “Best Of” tagline on its cover.) The magazine’s consists primarily of investigative articles, but the rest of the publication is written for suburban residents. It is a great read when you need to know about gossip, socialites and the best restaurant to take your beau on for an anniversary dinner. 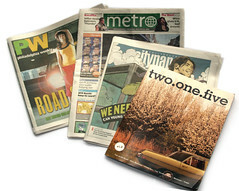 With its eye-catchy pictures and short but sweet articles, the Philadelphia Metro is ideal for busy college students. It provides steady coverage of the local Philadelphia community while maintaining a global perspective on its international coverage.and the Metro features talented regulars—read Brian McCrone’s provocative crime reports and Dorothy Robinson’s witty gossip column. From Kensington fires to college shootings, Action News drives right to the scene to provide viewers with 90 seconds of news. Although it covers more of the suburbs than the city, it’s good for a quick summary of the news when you’re rushing out the door. Look for Action News anchor Jim Gardner, a strong reporter who’s been with the team since 1976. Now that’s dedication. Temple’s dining choices facilitate meals for students.